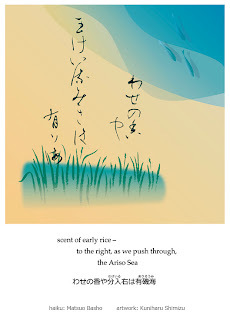 Basho wrote this haiku as he entered Kanazawa, where Maeda feudal lord had the catsle. Maeda clan was the most powerful one among 242 lords in Japan then. As customary practice for haijin entering into a territory governed by fuedal lord, Basho wrote this haiku to pay respect to the lord. 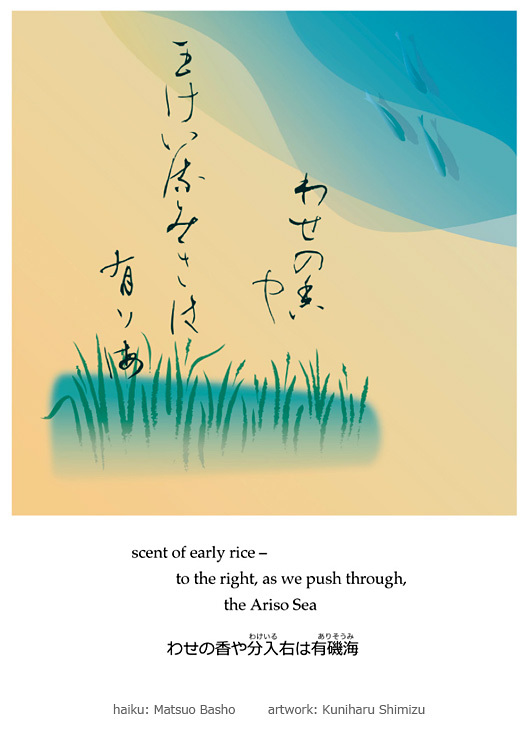 Basho wrote the haiku to praise the abundant richness of farm crops and general prosperity in the territory. The city of Kanazawa now retains old things but at the same time has very contemporary art museum, and a good art and craft university. Love how the characters rise like the smell coming up from the rice. The image of the words and the art fill my senses. They take me to the water, I smell the rice and the sea, and i feel a gentle breeze all at once. They evoke a calmness in my mind as I sit with this Haiku. Thank you.